The 4 Carat Princess Cut Diamond Ring Guide - Easy Money-Saving Tips! “Go big or go home,” right? While this quote is relevant to some, it’s a different story for 4 carat princess cut diamonds. Going big in terms of size will only thrive if the other 4Cs are in check. There’s no either/or; what matters is to go big but also to go for the best cut especially for a princess cut. A big carat size is also synonymous with higher pricing. Pair it with an ideal cut, and we’re looking at diamond prices comparable to the value of a house and lot! Good news is, the rest of the 4Cs can, fortunately, be adjusted so you can save money! 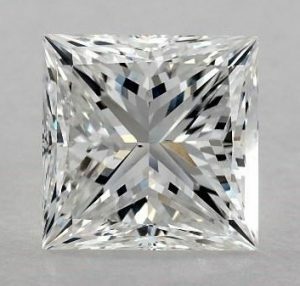 In this post, I’ll be showing you how to find a diamond as big and brilliant as a 4 carat princess cut that’s priced much lower than you expect. Let’s get started! So, why 4 carats instead of 5? Why not go all the way to 10 if we’re going big anyway? Okay, maybe that’s a bit much. But believe it or not, 4 carats is a strategic number. Since engagement rings bear emotional value, some tend to identify with the tiniest details – such as a specific number. By choosing 4 Carats, you'l be steering away from popular carat weights like 1 and 3, and you somehow get to own a unique number. Although not as popular, it's still big and beautiful nonetheless! Although 4 carats is not as in demand as 1ct., it’s still a pretty solid number compared to 3-digit sizes like 3.95ct. Many would want a single digit flaunted in their diamond’s grading report for ideal purposes. However each of us sees the 4 carats, it’s still big and, a princess cut shouldn’t be taken lightly. With a significant carat size and shape, the most vital thing to look for is authenticity. Not just if it’s a real diamond or not (which shouldn’t be the case if you shop at renowned diamond stores) but also the accuracy of the 4Cs. Because it’s through these grades where we’ll know the true cost and value of a 4 carat princess cut diamond. Before anything else, make sure that the one that caught your eye is certified by either GIA or AGS – the top grading labs in the world. We talked about the sheer importance of the diamond cut one too many times. And I guess I will never get tired of mentioning it in every post I write because it is what it is. That it’s the maker and breaker of the diamond sparkle. Same goes for 4 carat princess cut diamonds. 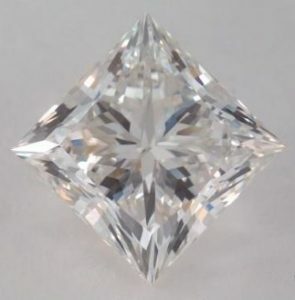 Cut is the only 4C parameter that’s uncompromisable in all carat size and brilliant diamond shapes. Get to know the princess cut here! Choose your ideal l/w ratio and number of facets and chevrons, but most importantly, make sure it has an ideal/excellent cut. Now, we’re talking! This is where you can potentially save money. We’re not rooting for the best color because color is subjective. Some might find an H color icy-white to the naked eye, while others are more captivated by the warm tones of the J to L colors. The fact is that G color will face up just as white as an E color. Unless you’re a perfectionist or have a personal affiliation with the highest color grade, you don’t have to have the colorless grades. 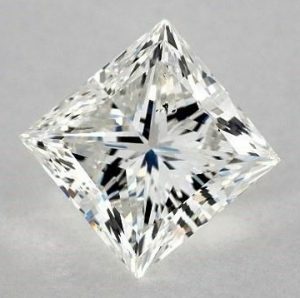 A lot of other factors contribute to the visual performance of the princess cut. This comparison is only shown to prove that a high color grade doesn’t necessarily mean that the diamond will appear whiter. One important thing to point out is that since 4 carats is huge, a better color grade is advised. So if you think that G is already warm to you, you may upgrade to F or more if you have a flexible budget. Another money saver tip is that if you pair your 4 carat princess cut with a rose or yellow gold ring, you may opt for a much lower color grade as it will appear whiter than it is amidst a darker setting. VS2 is your safest bet in finding eye clean stones. Again, unless you prefer the highest grades for ideal purposes, there’s no reason to go for a high clarity that you wouldn’t appreciate with your bare eyes. 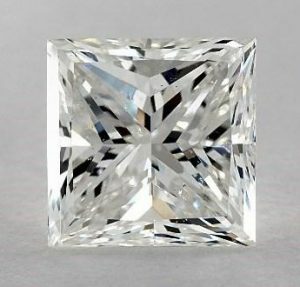 Yes, we should be aiming for the best clarity since we’re dealing with a big diamond, but 4 carat princess cut diamonds with VS2 clarity are almost always eye clean. And that’s what really matters – that you don’t see any inclusion that will take away from the beauty of the diamond. One of the diamonds below is a VS1, and the other is a SI1. Click the images to know which is which! 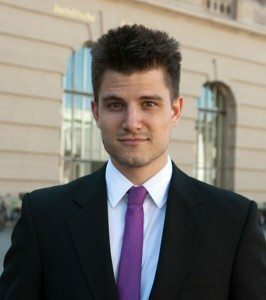 If a clarity grade that high is indistinguishable to a VS2, should you still consider it? That’s up to you! Although if you want to save more, check out diamonds in the SI1 grade. If you dig hard enough, I’m sure you can still find eye clean stones. Speaking of clarity, we initially pick diamonds with our eyes. Imagine there’s a selection of 4 carat princess cut diamonds in front of you. All of them are certified and bear ideal cut proportions and a color grade you like. Now, the only deciding factor is clarity. In a brick and mortar store, you’ll be given a loupe with 10x magnification. But what reputable online diamond stores can compete with is high-tech imagery. These are high definition 360-degree videos and real-life images up to 40x zoom! Vendors like James Allen provide more options and affordable prices. Nowadays, it’s just practical to go for this route, plus it’s a 100% safe. Check out my online diamond store reviews and see for yourself! A 4 carat princess cut diamond ring is a true stunner. Its size is in-your-face, and its shape – ever mesmerizing! Given the tips above, you have all the tools to maneuver color and clarity, so you can maximize your budget and get your money’s worth. Or better yet, save a couple of grand for an even bigger carat weight! Got questions? Ask away in the comments section below or email me here!